I’ve had the same black and white bedding for absolute ages (absolute ages = about 10 years), and I’ve been hankering for a change. That said, it’s not something I have really needed, so I haven’t really done anything about it. That was until this past weekend when I decided to dust off my (very old) sewing machine and give my bedding a facelift. To start, I decided to change my pillows. My friend, who happens to be a very talented seamstress, agreed to give me a tutorial on pillow making. I dispatched myself to G Street Fabrics and JoAnn to get the necessary materials to recover 2 big pillows from my bed (and in the process picked up an extra pillow and fabric – I just can never leave well enough alone). Between the two stores, I managed to find two great fabrics, a deep pinkish orange and a complementary print for my bed. My tutor and I set up shop at her house. We had dueling sewing machines for the better part of 3 hours as she helped me learn how to make perfect pillow coverings. Of course, she had the pattern all in her head, but for those of you who don’t have a teacher around, this is a comparable one. Here are some helpful hints that I learned in this process. 1. Check the remnant section of the fabric store for good deals. I found my orange fabric in the remnant section at G Street Fabrics. For those that are unfamiliar with the lingo, remnants are leftovers from the large bolts of fabric they sell. The stores want to get rid of every inch of fabric, so they offer the remnants at a cheaper price to get the most out of their original investment. Remnants are prefect for smaller projects, like pillows, and when the fabric is less expensive, it does take some of the pressure off about screwing up. 2. Never be too cool for instructions. 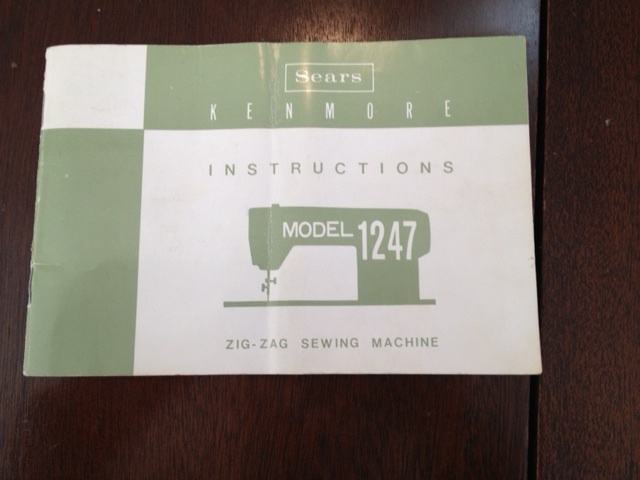 My sewing machine is (much) older than I am. I have no idea how these instructions have stayed with it for 40 years, but I am oh-so glad they did. Each machine is a little different, so getting it set up and remembering everything took a good 45 minutes. Without the instructions I would have been totally lost. If you have an oldie (but a goodie) like me and don’t have the instructions, check YouTube for an instructional video. You wouldn’t believe how many are out there! **Incidentally, after reading this handy little book more closely, I realized that my machine has super powers (and by super powers I mean the power to automatically sew buttons on, monogram etc)! 3. Always, always iron. Of course, we know I hate to iron, but when it came to getting the seams right, it was invaluable. Check out those seams (and the antique sewing machine) below. 4. Don’t be afraid to screw up. Take this advice with a grain of salt because a) I was scared of screwing up and b) I had my very patient teacher checking my work at every step. BUT, the moral of the story is that you have to try, and if you screw up, you can start over. This pattern is VERY forgiving, so you have some wiggle room. If your seams are ugly, stick them on the inside where no one will see them! Here is the finished product. What do you think? I’m super excited! It’s a great new pop of color in my formerly black and white bed. Next project, is creating a new duvet cover. I’ll let you know how it goes! These are beautiful! Can you come to my house? I will come by anytime – I need the practice! They look great! Congrats on your first sewing project. I’m impressed. Pillows really are the easiest. You can even make them out of old shirts, skirts, dresses, etc. (front + back – arms = pillow) And what they charge for pillows in the stores and online is total robbery. I have big plans to start my own Poe’s Ridiculously Overpriced Pillows line someday. What a great idea! I love the idea of using old clothes to make pillows. Let me know when you start your business. I want in on the action!